Mandarmani is a seaside resort village in the state of West Bengal, India, lies in East Midnapore district and at the northern end of the Bay of Bengal. 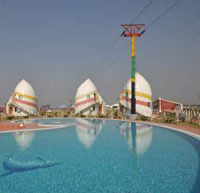 It is one of the large and fast developing seaside resort village of West Bengal. 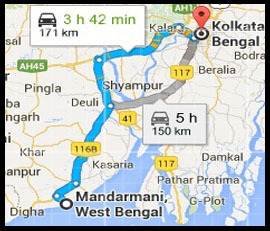 It is almost 180 km from Kolkata Airport on the Kolkata - Digha route. red crabs crawling around the 13 km long beach is a special attraction of Mandarmani. It is argued to be the longest driveable (drive in) beach in India. Geomorphologically, this area has relatively low waves than nearer tourist beach of Digha. However still this beach is deposition with formation of neo dunes in several areas specially around Dadanpatrabar. The beach is the primary attraction offering tourists to enjoy the sea from early morning to late afternoon. From 3 PM onwards, people head out near Rose Valley Hotels where beach bikes , ropeway etc can be availed. There are also a string of local shops selling shells , handmade jewellery and handicrafts. A few locals also offer groups to take trip towards the mohana (Estuary) during sunset.